Happy August! As August is upon us there is usually a big push to get back on track with health goals as we approach the holiday season. I know a lot of folks are starting on a Whole30 or the 21-Day Sugar Detox to eat squeaky clean after straying a little during the summer. 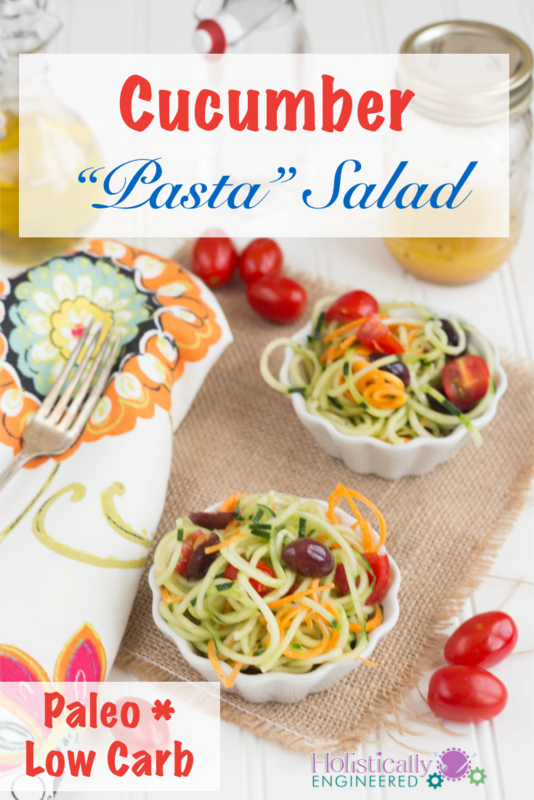 One of my favorite summertime salads to make is a “pasta” salad made with cucumbers. It’s so light a refreshing! 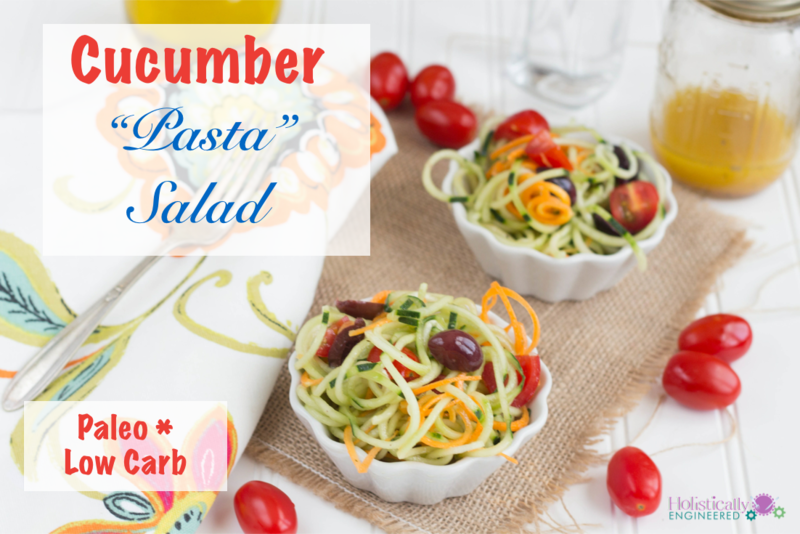 The Cucumber “Pasta” Salad is a recipe from my ebook Squeaky Clean Paleo: 100+ Recipes to Beat Boredom and Ditch Cravings, but this time I decided to make “noodles” out of the carrots too. I usually end up serving this salad with a side of grilled chicken for a nice light summer meal without having to turn on the oven. I hope you enjoy the “pasta” salad and good luck with your health and wellness goals! In a large bowl, combine the cucumber noodles, grape tomatoes, olives, and carrots. To make the dressing, add the olive oil, red wine vinegar, apple cider vinegar, garlic, Italian seasoning, salt, red pepper flakes, and black pepper in a pint sized mason jar. Screw the lid onto the jar and shake for 1-2 minutes or until thoroughly combined. *When buying olives make sure the olives aren’t packed in low quality vegetable oils or have added preservatives or additives. Also check for preservatives/additives in any of the seasonings you buy, especially the Italian seasoning.